The Cow and the Bull is an interesting rock formation just south of the Glass Window Bridge. They are two large boulders that from one side look like a cow and a bull and from the other side look like two cows and one bull. It is said that when a strong wind passes through it sounds like a roaring bull. The access is 0.4miles south of the Glass Window Bridge, directly across the highway from the northern parking area for Twin Sisters Beach. From the parking area walk up towards the Atlantic Ocean for about 70 yards and you will see the two large boulders. 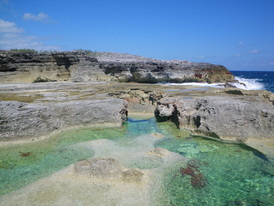 The Queen’s Baths are deep tide pools that have been slowly carved into the rocks over time. They fill with fresh seawater at high tide that slowly warms in the sun as the tide recedes, creating a luxurious natural bath. There is also a large cave behind the pools. The best time to visit the baths is at low to mid tide when the sea is calm. When the sea is rough or the tide is high you can easily be washed out to sea, this has happened before so please do not take the chance. The access to Queens Baths is located 0.6 miles south of Glass Window Bridge or 0.2 miles past the Twin Sisters’ pullout on the Atlantic side of the road. 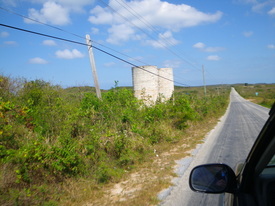 There is a Bahamas historic sign along the road pointing to the parking area which has an old stone fence surrounding it. After parking walk up the old road about 100 yards and head toward the sea. The baths will be down and to your left. Twin Sisters is a beautiful Caribbean sandy beach just south of the Glass Window Bridge. It is named for the two big boulders about 70 yards off shore, the twin sisters. It is a fairly small beach, but it is easy to get to and offers great snorkeling and swimming in one location. If you are coming from the north Twin Sisters beach is 0.4 miles south of the Glass Window Bridge. You should be able to see the Twin Sisters in the water from the road and soon after a pullout on the right side of the road. If you are coming from the south the pullout is about 4 miles past Pam’s Island Made in Gregory town. Gaulding Cay Beach is another beautiful sandy Caribbean beach. It is not very large and there are about a half dozen homes along the beach but it is still quite private. 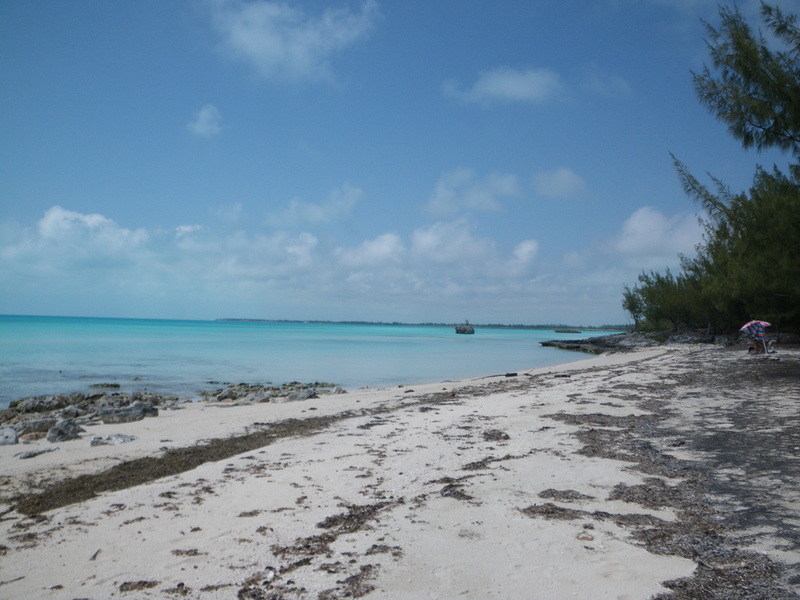 It is also a great spot for both swimming and snorkeling around the outer edges of the Cay. At low tide you can actually walk from the beach out to Gaulding Cay. The road to get to the beach access to Gaulding Cay Beach about 1.1 miles south of the Glass Window Bridge, directly across the street from Daddy Joe’s Sandbar. Turn down this road and travel a short ways until you reach a Y in the road, take a right, keep going the road will turn to the left and end just before the beach. Holiday Beach is a good place for surfing if you need a change from surfer’s beach. It is a much faster break, and has more reefs than Surfers’ Beach. The beach is just a tiny little thing and the rest of the area is rocky so it is not that interesting for anything other than surfing and sightseeing. To get to Holiday Beach from the north take a left 0.4 miles past the Laughing Lizard Cafe, or from the south take a right 0.4 miles past Pam’s Island Made Gift Shop. Follow this road for approximately 0.4 miles and take the first left, this road will veer to the right, then keep following straight in about a half mile you will reach the Beach. 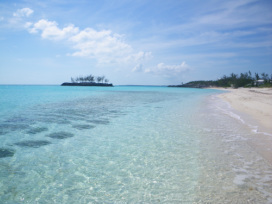 Surfers Beach is one of the most well known beaches on Eleuthera and one of the most famous surf breaks in the Bahamas. Most of the waves break over a shallow inside reef called “The Bone Yard”. This beach is best for surfing but it makes a great stop for sightseeing and on very calm days you can snorkel around the small cove at the north of the beach. To get to surfers beach from the north, turn left 2 miles south of Pam’s Island Made at the sign for “Surfers Manor”. From the south go 3.3miles north from Front Porch Delights and take a right at the “Surfers Manor” sign. Follow the road past Surfers Manor until you reach a T, take a left, then your first right onto as sandy beach road. It is recommended you have a vehicle with high clearance on this road so if you do not park as soon as you can and walk to the end. The Hatchet Bay Caves are a mile long cave system filled with saltwater pools, stalactites, stalagmites and bats. 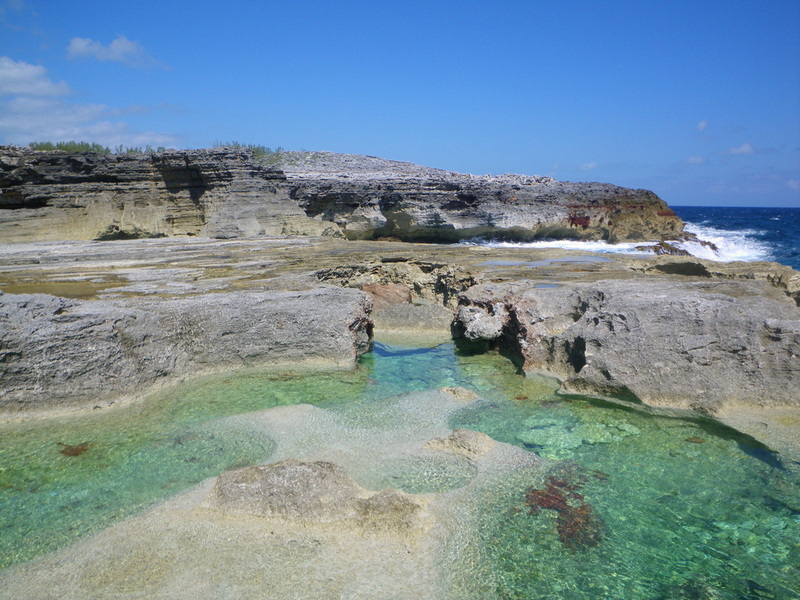 It is the most extensive cave system on Eleuthera, with at least 3 levels and two entrances/exits. It still has not been fully explored. The first level is the entrance to the cave and does not extend far before reaching a ladder to the second level. This level has a small pool and towards the center there is ancient graffiti made by carbide lamps and dating back to the late 1800’s. The newer graffiti is just modern careless destruction. The third level is full of deep water and mud pits. The water level is dependent on the tide and this level should only be visited by the experienced spelunker, with a local guide. If you’re into spelunking go check it out, but remember to bring a good flashlight, plus a backup and go at midday to limit you bat interactions. To get to the caves from the north, travel just under three miles south from Gregory Town, the road will be on the right hand side. To get there from the south, go 2.5 miles north of Hatchet Bay/Alicetown, the turn is on the left. There is a round blue Bahamas Heritage Site sign at the turn. Follow the dirt road just over a tenth of a mile and you will see the parking area for the cave entrance to the right. The fields between Hatchet Bay and Rainbow Bay are the old Hatchet Bay Plantation which used to be a huge agricultural hub for Eleuthera. In the late 1930’s the ground was cleared and scarified and topsoil was added to some areas to make it suitable for agriculture. Grasses were planted as feed and 1000 dairy cows were brought in. Once the cattle farm was established they added a poultry farm. The giant silos were used to store the cut grass (fodder) to produce silage (fermented fodder) to feed the cattle. The silos never worked well enough to provide enough food for the cattle so grain had to be shipped in. The plantation continued into the 1980’s but due to the high cost of feed, lack of fresh water and competition from farms on other islands the plantation eventually shut down. What remains of the plantation today is overgrown fields and the giant deteriorating Silos. Recently some small farms have been re-cultivating the land by hand. (Wm J Godfrey Eneas, 1998; Agriculture in the Bahamas : its historical development, 1492-1992). The old Hatchet Bay Plantation was known for dumping byproducts from its chicken processing plant into the ocean on the Atlantic side at Hatchet Bay Beach. This attracted numerous sharks, so the beach earned the nickname “The Shark Pit”. Since the closure of the plantation the sharks have cleared and now Hatchet Bay Beach is known to have some of the islands biggest surf breaks. Be especially careful here as there are numerous rocks and entry can be quite treacherous. The current is very strong here, especially when it is going out and it can easily pull you into the cliffs if you are not careful. To get to Hatchet Bay Beach from the north, take the first road to the left after Front Porch Delights, there will be a Hatchet Bay sign on the opposite side of the road. To get to Hatchet Bay Beach from the South take the first road to your right after the baseball field. The road will have a BATELCO sign and is paved for about a half mile until you pass the power plant. Continue past the power plant for about another half mile until you reach a gate with a no trespassing sign. Take the road to the left just before the sign, park and walk down the path to the beach. Rainbow Bay Beach is a popular beach on the Caribbean side of the island. It is commonly used by most of the homeowners in the area, but it is open to everyone. It's a great place for swimming and snorkeling especially when the water is rough on the Atlantic side. To get to Rainbow Bay Beach from the north go approximately one mile past the Rainbow Inn and take a right onto Wandering Shore Drive. If you are coming from the south, go just over two miles past the Big Rock Grocery and DJ’s Take Away, and take a left onto Pirate Lane, this will connect you to Wandering Shore Drive. Follow Wandering Shore drive approximately a quarter mile till you see the Rainbow Bay Park parking area. Hidden Beach is located on the Atlantic side and is another popular beach for the Rainbow Bay residents. It is good for swimming and snorkeling but only when the ocean is calm. When the waves are big this beach is known to be a decent place to surf. The waves break over shallow reefs that are closer to shore than Holiday or Surfers beach so as usual take caution.